The AQUILA A 210 is a single-engine airplane in fibre composite construction and designed for cruising, training and aero-tow applications. It is equipped with two side-by-side seats, low wings and a cruciform tail. AQUILA Technische Entwicklungen GmbH with its headquarters in Schönhagen near Berlin is responsible for development and production of the aircraft. The wing employs a low-drag laminar flow airfoil with Fowler flap of the Horstmann-Quast (HQ) series which was specifically designed for this airplane by DLR Braunschweig (German Aerospace Center). 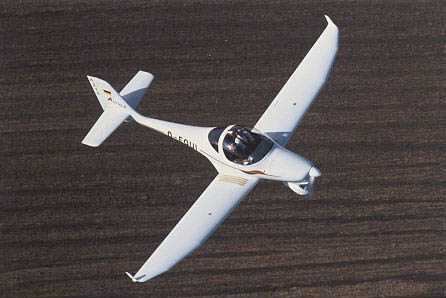 The triple-tapered plan form of the wings provides excellent flight and handling characteristics at minimum drag from cruise speed down to stall speed. The electrically operated Fowler flap is very efficient and produces high maximum lift in landing configuration. This results in low landing speeds and allows short landing distances due to appropriate drag production. In takeoff configuration it produces sufficient lift to safely operate the airplane from short, unpaved runways. The shell structure of the wing is made in GFRP/foam sandwich construction. Spar and load bearing structures are made of CFRP. Empennage, flaps and control surfaces are made in GFRP/foam sandwich construction with CFRP reinforcements. The fuselage is a GFRP monocoque with CFRP stringers and GFRP/CFRP frames. Due to the side-by-side arrangement of the seats, the spacious, enclosed cockpit provides sufficient room even to tall pilots. Complete glazing of the canopy allows an excellent all-round vision which is particularly advantageous during instruction and training. The baggage compartment is located behind the adjustable seats. It can be easily accessed through a door located on one side of the fuselage. Baggage compartment capacity is meeting even the highest demands. The fixed tricycle landing gear consists of the main gear in sturdy steel strut construction and a conveniently spring-suspended, steerable nose gear. Three large wheels of the same size allow aircraft operation even under severe training conditions as well as operation from uneven runways. The individually controllable main-wheel brakes as well as the nose wheel to be operated by the rudder pedals allow narrow taxiing manoeuvres. The hydraulically operated constant speed propeller of type mt-propeller MTV-21-A/175-05 is driven by a 4-stroke / 4-cylinder piston engine of type ROTAX 912S (100 hp). Two integral tanks inside the wings with a fuel capacity of 60 l each, low fuel consumption and a high cruising speed allow a range that is exceptional in this category of aircraft. The possibility of operating the engine with unleaded premium automobile gasoline further improves efficiency. Being well below future noise limits will allow aircraft operation at any airfield without any problems. The electrical system is designed for 14-volt supply including alternator and battery. All electrical loads are controlled by individual circuits and connected to the supply system by means of rocker-type switches or circuit breakers respectively. An ignition switch actuates two separate ignition circuits. The AQUILA A 210 airplane is certified according to JAR-VLA allowing unrestricted VFR day operation exept aerobatics. The aircraft will be also certified for glider towing operation.